Mistakes happen in life, and washing machine overflow can happen to the best of us. Whether your kids improperly add the wrong amount of soap to the front loader or there is an internal electrical problem, Bloomfield Construction can help you clean the mess left behind. However, if it’s not a user error, what problem causes washing machine overflow? Typically, the fill valve that is stuck open due to sediment build up or an electrical flaw, causing the washing machine to overflow. One way to figure out the cause of the problem is by filling the washer on “cold fill” and stopping it. Upon doing this, if you notice the machine is still pouring water, you should then pull the plug on the washer. If this does not resolve the issue – this is an indication that there is a mechanical problem. The valve may need to be replaced. However, if the fill stops when you unplug the washing machine, the cause of your washing machine overflow is an electrical problem. That’s where we step in to help keep you continue your day without the worry of mold growth and water damage ruining lower ceilings and hardwood floors. Our staff is available to you 24/7 and is usually at your home within an hour of your call! We take pride in our workmanship and professionalism. 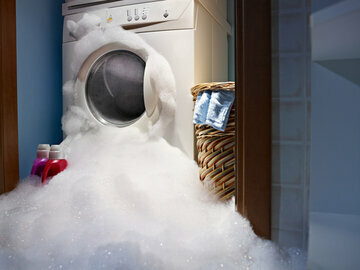 When you contact us to help – we’ll be there to make it look like you never had a washing machine overflow. Contact Bloomfield Construction today for a quote on your washing machine overflow repairs and costs – we’re here for you, and we work with all insurance carriers!